Anyone that has flat feet, plantar fasciitis, fallen arches, or just tired and achy feet may benefit from orthotic inserts. If you’ve never heard of them, or if you’d like to know more about the benefits they can offer you, my buying guide can help. Additionally, I’ve also rounded up several high-quality orthotic inserts and reviewed them so you can get a good idea of the different options that are available to you. You can compare them all at a glance with my comparison table, and my video can also give you valuable information. There are three basic types of inserts you can get for your shoes. These inserts slip into your shoes and provide cushioning and support for a wide variety of foot problems. They can be made from a variety of materials including gel, foam, or plastic. These inserts can help with a variety of common foot issues to give you relief from any pain or aching you may have, especially after you’ve been on your feet all day. Orthotic inserts do require a prescription from your podiatrist, but this means that they can be specially designed to fit and help with whatever foot problems you may be experiencing. Over the counter options and semi-custom orthotics work as well. It comes down to how much relief your over the counter or semi-custom inserts give you, and if you need something completely customized to your needs. When you put an orthotic insert into your shoe, it acts as a barrier that prevents your foot from moving or flexing in a way that it isn’t supposed to move. They can also work to realign your ankles and your feet so you can balance yourself and distribute your weight evenly from side to side. Orthotics also have a layer of cushioning built in, and this can help to prevent you from having constant pressure on sore spots on your foot. These painful spot areas include your ball of the foot, heels, bunions, and any corns between your toes. It’s important to note that your new orthotics, even prescription ones, won’t heal your foot problems. They also don’t physically change your foot’s current structure. However, they can help you manage the symptoms that go along with your problem so you can have less pain and it’s more comfortable to stand or walk around for extended time periods. These inserts can also act as a miniature shock absorber. These types of inserts can help with a wide variety of foot problems, and they can help with different severity levels as well. Fallen Arches – If you’ve had a foot injury, arthritis, or if you have too much stress on your feet, it can cause fallen arches. Orthotic inserts for fallen arches help to reduce the amount of pain you feel when you’re standing or walking by providing a layer of support and cushion. Flat Feet – Orthotic inserts for flat feet give support to your arch area. This additional support can help you walk and move around easier, and it can also help to decrease any aching or pain you may have. The best shoe inserts for flat feet won’t correct your problem, but they’ll help you manage it. Plantar Fasciitis – Orthotic inserts for plantar fasciitis can help to reduce the amount of tension in your foot. In turn, this can decrease the amount of discomfort or pain you may feel as you go about your day to day activities. The orthotic inserts must fit and mold close to your arches for effective relief of your plantar fasciitis symptoms. As we mentioned earlier, there are three main types of orthotics you can get. Each one has benefits and drawbacks, and it comes down to personal preference. Over the counter insoles are one of the easier types of insoles to get. However, they’re also the ones that you can customize to your needs the least. These orthotics are typically made out of plastic, gel, or foam. You don’t need a prescription for these, and you can pick them up at almost any drugstore or pharmacy. Semi-custom insoles are designed to fit your feet a little better than traditional over the counter insoles. Your family doctor or your podiatrist may recommend these types of insoles if you’re having increased pain or if you’d like more support that over the counter insoles can give you. These are generally ordered over the counter with options that allow you to customize the fit and the feel. The final tier of insoles you can get are custom insoles. These are considered to be some of the best orthotic inserts for arch support and some of the best orthotic inserts for flat feet. However, you do have to get a prescription from your podiatrist or doctor before you can get them. These insoles mold to your feet and give you superior support and comfort because they’re custom fit to you. Prescription orthotics are usually covered by your insurance, depending on the insurance you have. Semi-custom orthotics are not usually covered, but they’re generally very affordable no matter how tight your budget is. Finally, over the counter orthotics are not covered by insurance, and you pay for the entire cost out of pocket. However, they’re usually also very affordable. If you have questions about whether or not your insurance will cover your orthotic insoles, it’s usually easier to call your insurance company and speak with one of their representatives. They can tell you if they’re covered, if you have a copay, or if they don’t cover them. Now that you know what orthotic inserts are, what they can do for you, and how they compare against each other, I’ve reviewed a few of the best arch support for flat feet, plantar fasciitis, and fallen arches. I invite you to take a look and decide which ones will fit into your lifestyle the best. When it comes to having flat feet or plantar fasciitis, you need a lot of support. Stride Insoles offer support along the full length of your foot, and this can decrease the aches and pains or tired feeling that comes with being on your feet all day. You can choose from four different arch heights, and this allows you to customize a great fit. 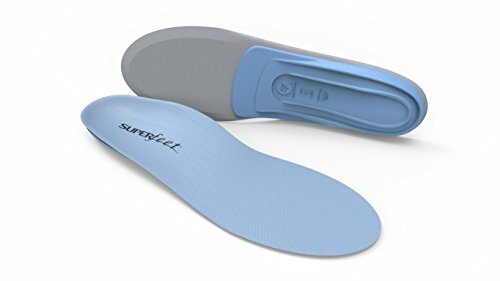 They are a more firm insole, and they were specially designed to give a reasonable level of pronation control, and this added control helps to alleviate any pain or discomfort levels. They also have an antimicrobial treatment built right into the insoles, and this can kill up to 99.9 percent of odor-causing bacteria and fungus or infections. You can replace the top covers to keep your insoles fresh and clean as well. Here is a video I made showing how easy these insoles are to customize and change. Disclosure: I received samples of these insoles at no charge for the purpose of making this video; however, I received no other compensation. These insoles are made out of a durable but comfortable Trocellen foam that can withstand a lot of wear and tear. This insole goes along the entire length of your foot, and it offers heel support and stabilization through the polypropylene stabilizer cup. This cup goes three-fourths up the length of the insole, and it can help it to adhere to your shoe for a non-slip wear. You’ll enjoy built-in odor control technology, and they’re very easy to clean with mild soap and warm water. They also come with a removable and interchangeable cover to help you keep them clean. This insole features a very rigid design, but this allows it to offer excellent arch support. They are designed to give you relief from aching and tired feet or pressure points. In addition to this, the rigid design helps to keep your insole where you want it in your shoe. The M100 series is designed to fit into work boots or heavier shoes while Protalus’s T series is more lightweight and slender. 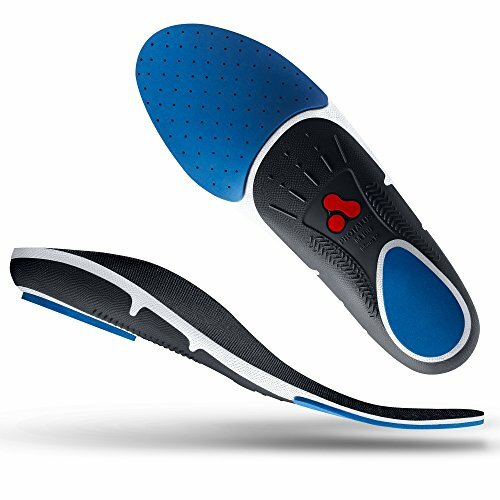 The M100 insoles feature a sleek design that adheres to your foot’s shape and curves to help alleviate pressure points and correct your gait. In turn, you can experience less pain in your feet, hips, legs, and lower back when you wear them each day. These insoles also work to align your ankle joint properly, and it offers superior arch support. You’ll also get a curved heel cup that forms to your heel, and there is built-in tri-planar technology. This technology acts as a shock absorber when you walk, and it can also give you a higher level of control and comfort when you wear it. You can remove them and wash them with mild soap and water and leave them to air dry to clean them. Click here to check today's price on the Protalus Insoles at Amazon. 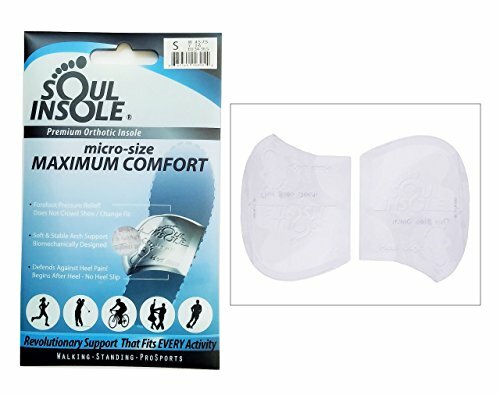 Soul Insole’s orthotic insoles are extremely thin and lightweight, and they’re designed to fit into a variety of shoes. It works to reduce pain and pressure in your heel and forefoot by redistributing the pressure as you move. These gel inserts sit in the middle of your shoe to offer arch support. They help to prevent over-pronation as well. They’re made out of a medical-grade gel that has antibacterial properties. It’s also designed to be odorless, flexible, and soft so you can get the right amount of support but still be comfortable. These orthotic insoles are very easy to clean and maintain. You rinse them with mild soap and in warm water. This will reactivate the gel, so it sticks firmly into your shoe, and it’ll clean away any bacteria. Air dry or pat them dry with a towel and they’re ready to put back into your shoe. Learn more about the Soul Insoles at Amazon by clicking here. This shoe insert combines support with plush cushioning that forms to the length of your foot. There are over 20 different sizes and two types available so you can customize it to get a good fit. They come with an EVA foam base and several layers of cushioning. There is a deep heel cup and firm arch support to help reduce any aching or pain you may have. It is coated with friction and heat-resistant fabric that helps your feet stay dry, cool, and free of any odors. It is designed to work with low, neutral, or high arches, and it can fit into almost any shoe type from high heels and work boots to slippers and slip-on shoes. The shell is firm but still offers enough flexibility to ensure that you can move around comfortably and easily. 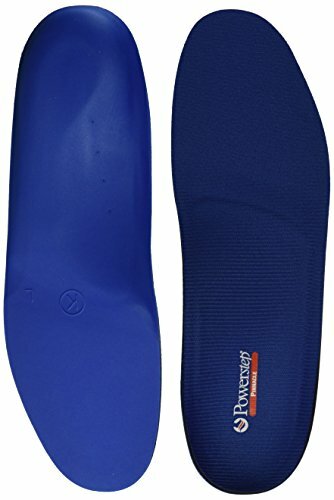 Click here to see today's price at Amazon on the Powerstep Insoles. My pick for the best shoe insert or orthotic insole is Stride Insoles by Tread Labs. They provide entire foot support, and they have four different arch sizes to choose from so you can customize your fit. They are very simple to customize the fit and they are extremely durable. The antimicrobial treatment is also a nice feature, and the more rigid support helps with a variety of common medical conditions like flat feet and plantar fasciitis. They can keep you comfortable through all-day wear, have an easy return policy, so this makes them my number one pick. Do you have any advice for dealing with these common foot problems? Have you tried another insert that helped? Feel free to share your advice and recommendations in the comments below! If this article was helpful at all, I would also appreciate a social share! I’m disappointed that nothing was mentioned for ball-of-foot pain, such as Morton’s neuroma.